Dust plumes behind my SUV as it veers along an unpaved track between vineyards, first to one edge, then to the other, to avoid the worst of the crevices. At the base of a hill, a bus straddles a gully crosscutting the road, marooned. It took a chance on the angle and lost. An ominous sign this early on in my search for remarkable wine? In fact, I’ve barreled down these washboard roads in northern Baja’s Guadalupe Valley before. In 2009, the region was a little rough on travelers, with only a few inns for the weary and scarcely a recommendable restaurant. But there was palpable buzz about the wine. A small band of innovators had been turning out bottles head and shoulders above the mass-produced, commercial wines that the area was known for. And by recent accounts, that swell of exciting wine had turned into a wave, making a new fact- finding mission hard to resist—especially since the valley is less than two hours from San Diego by car. On my first visit, prominent winemaker Hugo D’Acosta had explained the driving situation this way: “Good roads, bad tourists; bad roads, good tourists.” (Translation: If you need perfectly smooth pavement, maybe this isn’t the wine region for you.) Whatever else may be going on in the area, the journey hasn’t changed. Only the main arteries are paved. Does that mean progress is stalled on all fronts? Could a place where the routes trap buses really make wine worthy of crowds? When the dust settles, Vinícola Torres Alegre y Familia rises against the ancient, boulder-strewn peaks, a riotous carpet of green vineyards spreading between the winery and the mountain backdrop. A mélange of adobe, glass, and wood over a base of the ubiquitous valley rock, the winery seems like an anomaly—as do vines in this place, for that matter. Wine isn’t exactly Mexico’s beverage of choice; that would be beer. But it has the same history here as it does in California, grapes having been planted by the Spanish padres in the 1700s, mission by mission, up through what was then Mexican territory all the way to Sonoma. You have to reach way back in time to find the reason Mexican wine drew the short stick: When the Spanish government realized the potential competition beyond the church for their country’s own vino, they banned its commercial production. The pedigree of Victor Torres Alegre, who has a PhD in enology (from Bordeaux), compels me to start tasting here, to suss out just how far vintners have come in 2017. Inside, Victor’s son, Leonardo, leads us into the bowels of the place, which was designed for state-of-the-art gravity-flow winemaking—grapes start at the top and drop into gleaming conical fermentation tanks, then finally into barrels. It’s all in the cause of gentle treatment (and, hopefully, finer wines). At the bottom, underground, the barrels rest in a cool, musty cellar lined with native stone, a ringer for a centuries-old cave in the Old World—a traditional touch in an otherwise ultra-modern facility. Victor and his son, Leonardo, at the Vinícola Torres Alegre y Familia tasting room. With that Nebbiolo lingering as a taste memory, I ignore the spotty GPS and follow the signs to a late lunch at Finca Altozano. The afternoon slows in the open-air dining room, and I find that my quest to discover the best bottles can wait for another day: Crisp tostadas arrive topped with rosy tuna tartare from the coast, just a few miles west of where the valley begins. Grilled octopus is finished with citrus, olive oil, cilantro, and peanuts in a cazuela (clay dish). A trio of rustic little tortillas shows up topped with lengua (beef tongue), lamb, and beans. It’s all the work of superstar chef-owner Javier Plascencia, who oversees eight restaurants in Mexico. Octopus with citrus and other dishes at Finca Altozano. My earlier visit suggested that the wine here was getting seriously good, but I’m not prepared for this kind of cooking. Back then, there were a couple of groundbreaking kitchens on the radar: Restaurante Laja, Baja’s take on The French Laundry, had just opened in nearby Ensenada to much critical acclaim (it still makes the lists of Latin America’s best restaurants); and a couple of years later, Corazón de Tierra brought its own garden-to-table concept to the valley. Visionary Baja chef Javier Plascencia. Now, a new wave of casual restaurants, led by Finca Altozano, has created a full-on Valle culture of gastronomy. The dining rooms in these eateries lack walls, for the most part, and wood-fired ovens and grills are the only kitchens they claim. With no nearby markets to speak of (except a weekly farmers’ market), ingredients are grown, raised, hunted, foraged, and brought in from the abundant waters off the nearby coast—fresh, simple, vibrant flavors that now vie with the wine as a reason to visit. Sunset in Valle de Guadalupe calls for a view. I head to the best one, from hotel Encuentro Guadalupe, a colony of high-style rusted-iron bungalows perched on the mountain at the northeast end of Valle. Abandoning the SUV for a hotel van, I’m bounced up a precipitous, slope-hugging road to the indulgent master villa at the top. My room consists of concrete, glass, and wood built around an enormous boulder—an outcropping of the mountain itself, giving new meaning to the word encuentro, as if I’m meant to actually encounter the mountain in my room. And since there’s nowhere to really settle down except for the bed, I migrate to the deck (which is the point of this place, after all). A small fireplace encourages lingering into the night, as the landscape’s green carpet darkens and a gazillion stars emerge to amaze my city soul. There’s palpable peace here—and the prospect of machaca (dried, shredded beef) and eggs for breakfast by an infinity pool in the morning. The pool at Encuentro Guadalupe. That might be an understatement for what Magoni is doing with his brand, Bodegas Magoni. He has 112 varieties, some of which are planted in experimental vineyards. “Many can work here,” he says. “We have a region that is generous. You grow a variety, and it’s good. But which express our unique climate and soil?” In his days-old tasting room, we sip and spit through a lovely line of bottles to test his findings, pausing only for Magoni to let his 6-year-old granddaughter swirl, sniff, and taste one. (It’s reassuring that the next generation will be equipped with the skill set to take all this to the next level.) Like the Sauvignon-Chenin at Vinícola Torres Alegre, a floral, spicy blend of Chardonnay and Vermentino explodes my expectations and eludes taste memories. “I didn’t want to make just another Chardonnay,” is Magoni’s reasoning. An aromatic and fruity but structured Merlot and Malbec mix that follows makes a strong case for Bordeaux reds in this part of the world. On a tear to experience all that is new here, I head to one of the valley’s up-and-coming winery gems—Bruma. An eight-room bed-and-breakfast inn on the property, called Casa 8, has already attracted much attention for its refined, organic style and use of recycled materials. The architect, Alejandro D’Acosta (brother of aforementioned Hugo D’Acosta), won’t let anyone throw anything away, I’m told. Even felled trees, apparently—because the focal points of the wild new underground barrel room are trunks that rise from the floor and soar, seemingly, through the roof and up through a shallow pond above. From the cellar-level trunk to the branches far above, D’Acosta’s futuristic forest shows a winery reaching far back into Mexican history to the roots of the craft and forward at the same time. Bruma’s new consulting winemaker, Lulu Martinez Ojeda. The consulting winemaker, Lulu Martinez Ojeda—hired, literally, yesterday—is the face of what’s to come. Having trained and worked in Bordeaux for more than a decade, she started going back and forth between Margaux and Valle de Guadalupe to launch a Valle label for her employers, the Lurton family, who own 20-plus estates all over the world. Because she has no Bruma wine under her belt yet, I taste her Bodegas Henri Lurton Nebbiolo. Elegantly structured, with layers of anise, tobacco, and dark berries, it has an inkiness that belies its heritage in Italy, where it’s often much lighter in color. “Mexican Nebbiolo,” I’m hearing it called. And I’m hooked. In the winery’s new restaurant, called Fauna, I get a preview of Valle’s culinary future. Since it hasn’t opened its doors to the public yet, tonight is a soft launch for friends and family. Lots and lots of them. The communal table, which starts in the dining room and then runs through a glass wall and onto the patio, is flanked by parties enthusing en masse over the dishes. The chef is David Castro Hussong, a scion of the family that owns Ensenada’s legendary Hussong’s Cantina, which reportedly gave the world the margarita back in 1941. For his part, Hussong left to cook in Mexico City, then at Noma in Copenhagen, before eventually working in New York, at the likes of Eleven Madison Park. When he heard about the prospect here at Bruma, he decided to forgo the international restaurant circuit and throw his hat into the proverbial ring. “My family is here. My life is here. And if I didn’t do it, someone else would have and gotten in ahead of me,” he says. Dinner that night moves from an asparagus, seaweed, and chia seed soup that brings earth and ocean together, to simple charred cabbage with a melt-in-your-mouth salsa rojo made with rendered beef fat, to perfectly grilled duck with a spiced apricot-orange relish honoring the Asian population of Mexicali. This is sophisticated cooking, an inspired use of local ingredients—revolutionary in a cultural sense. Fauna is going to be the reservation to score and Hussong the new superstar. I’m sure of it. On my last evening, the sunset calls for a venue that vies with Encuentro for “best” status. Surrounded by verdant vineyards and stark mountains, I’ve been periodically reminded—thanks to the unbelievably fresh seafood—that the Pacific is a mere 10 miles away. I take the highway out of Valle, then head off to the right. The road up to Bar Bura is as rustic as the valley-floor tracks have been. But as I tilt halfway to vertical and bounce up to the clifftop, I’m struck once again by a sense of remarkable discovery, a recognition of being in a destination on the cusp of breaking onto the world stage—where dusty trails lead to unforgettable scenes. Sunset above the Pacific at Bar Bura. From this implausible perch, the view stretches forever up the precipitous coast, Big Sur–style. Having dipped behind a thick marine layer, the sun draws an eerie, otherworldly glow from the ocean. I join the smartly dressed locals and expats grouped on hay bales and decide to abandon serious wine for sangria—and one more plate of tacos—before heading north for the border. The Guadalupe Valley is an easy two-hour drive from San Diego along the coast—just pack your passport and head south. Arm yourself with a map of La Ruta del Vino; the signage is good on the main roads, but GPS in the valley can be less than trustworthy. If you can handle Napa on your own, you can probably handle Baja wine country. Still, it never hurts to book an expert who is familiar with the wines. Valle de Guadalupe vineyards stretching toward the eastern hills. This much-loved Point Loma wine bar organizes regular tours to Valle. Hop aboard a comfy van, stop in Tijuana for street tacos, and sip vino along the way. Drawing on his personal relationships with vintners and chefs, Fernando Gaxiola offers custom, private visits for groups. Translation? You might slip by the long brunch line at Doña Esthela’s. Founded by a group of friends who fell in love with Baja, this is another option for group and private tours to Valle. Plus, their blog is a great place to get up to speed on the newest Valle food and wine happenings. A glass of red at Finca La Carrodilla’s tasting room. 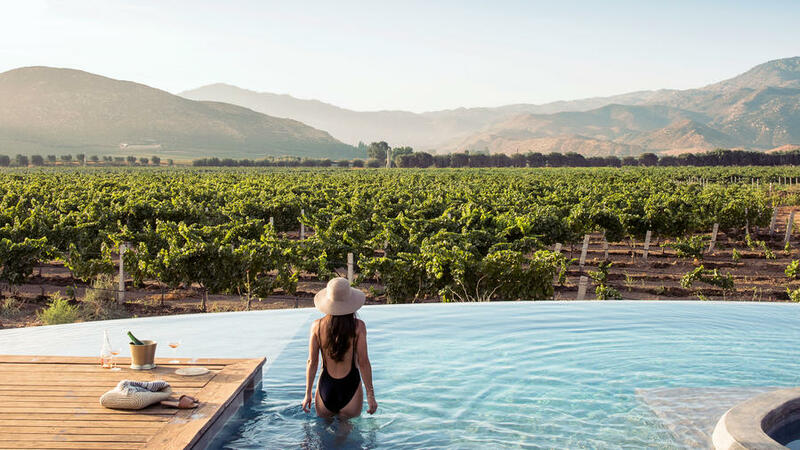 Valle de Guadalupe is now home to more than 200 wineries working with everything from Cab and Merlot to lesser-known grapes like Nebbiolo and Vermentino. There’s often a shaded patio or terrace where you can sip the wares while taking in the view of the vineyards. And not to worry if you don’t speak Spanish; English runs a close second here. Tastings generally cost $10 to $15, and U.S. dollars are as widely accepted as pesos. This winery combines the organic, reclaimed architecture of Alejandro D’Acosta with one of the valley’s up-and-coming winemakers, Lulu Martinez Ojeda. Don’t miss the magical barrel room, where hundreds of tiny circular windows illuminate stylized tree trunks rising up through the floor. The wines in this bright new tasting room showcase the craft of Baja veteran Camillo Magoni. Pick up some delicious olive oil and 18-year-old balsamic vinegar from the property while you’re there. Winemaking at this certified organic producer is now overseen by Gustavo Gonzalez, former red-wine maker at Robert Mondavi Winery in Napa Valley. His bright, citrusy Chenin Blanc and intensely fruited Syrah show attention to detail in the vineyard and the cellar. Founder Hans Backoff helped launch Valle’s quest for high-quality wine; 30 years later, his son (also named Hans Backoff) is taking the wines to a new level. Make an appointment for a tour, or just drop in and taste their fresh Sauvignon Blanc and aromatic Cabernet Franc by the lake. The Paoloni wines poured in an expansive, glass-walled upstairs tasting room celebrate all things Italian. The “Nebbiolo de Guadalupe” tastes like Barolo with more sun, and the “Sangio Grosso” channels Brunello di Montalcino. Ambitious local winemaker Ernesto Alvarez Morphy Camou has hired legendary French consultant Michel Rolland in the cause of producing the first Valle wine to earn 100 points from übercritic Robert Parker. Until then, try the savory Sauvignon Blanc and the peppery, Bordeaux-like Cabernet Sauvignon in this soaring concrete cube of a winery. +011 52 (646) 155-2433. Industrial-chic architecture reflects the technological innovations of founder (and PhD enologist) Victor Torres Alegre. Revel in the bird’s-eye vineyard views from the roof-level tasting terrace. Three labels—Del Viko, La Llave, and Cru Garage— offer everything from easy-drinking bottles to serious, age-worthy wines. +011 52 (646) 688-1033. In open-air dining rooms, Valle’s newest restaurants are creating a “Guadalupe gastronomy” that’s truly unique. Crave a fix of oysters and sparkling wine? This new eatery at Casa de Piedra is your place, with shellfish from local waters and the winery’s Espuma de Piedra bubblies. +011 52 (646) 162-8306. Oysters at Deckman’s En El Mogor. With tables set out in the open under pine trees, this is the most romantic dinner destination in the valley. Front and center is a flaming grill where Michelin-starred chef Drew Deckman (who grew up in Georgia) prepares some amazing quail—and much more. Baja’s newest star chef, David Castro Hussong. At Bruma Winery’s new restaurant, the 27-year-old New York–trained chef, David Castro Hussong, creates intense, complex, sophisticated dishes from Valle’s fresh ingredients. Order oysters and experience the region’s culinary future. Come early to score a table at star chef Javier Plascencia’s innovative yet crowd-pleasing restaurant. Order anything that comes off the grill in little cazuelas, and mop up the sauce with rustic fresh tortillas. The best breakfast in northern Mexico—and one of the few traditional Mexican menus in Valle. Doña Esthela, from the state of Sinaloa, cooks dishes from her childhood in the mountains. Her braised lamb is revelatory (and yes, delicious for breakfast; just order some eggs too!). +011 52 (646) 156-8453. Minimalism at its best: a simple patio fronting a prep kitchen in a repurposed shipping container, with vines in every direction. Chef Viviana Martinez, daughter of the Relieve Vinícola founders (the winery is connected, and just up the hill), searches out pristine local produce to serve alongside delicious octopus and rib-eye off the grill. +011 52 (646) 117-2737. Down a picturesque path around a pond, behind Lomita winery, this one’s a favorite of visiting chefs. They spot the skill behind this grill in the crisp-skinned chicken and the octopus that teams up with Valle-grown produce in a salad. +011 52 (646) 156-8469. On Wednesdays and Saturdays, El Mogor ranch and winery hosts a small farmers’ market. Local chefs have exclusive rights to the first hour, but then the array of tasty regional products—from fresh bread to unusual marmalades and salsas—is made available to the public. +011 52 (646) 156-8156. The range of stays is now wide in Valle, from traditional to cutting-edge. The room count hasn’t kept up with the number of visitors, so weekends generally book up far in advance; happily, there are several larger hotel projects in the works, and the logjam should loosen. In the meantime, quite a few Airbnb properties have come online and are good options too. The first high-end B&B in Valle, this Persian-inspired adobe is still the most gracious. The three restaurants on the property range from casual Italian to a Spanish tapas truck. Need a break from wine and food? Schedule a ride on one of the handsome Azteca horses in the stable. $275 U.S.
Expect organic luxury—and a multicourse breakfast—in the Valle’s newest inn. The grounds captivate with ancient oaks and a stunning little infinity pool. From $250 U.S.
At the coastal end of the valley, cozy tent cabins offer low-key luxury with a sense of adventure. Make reservations for a sunset drink at Bar Bura up the hill on the clifftop, with sweeping ocean views. From $221 U.S.
It’s pretty elegant inside these rusted-iron lofts perched on a mountainside, but the idea is to get out on your deck—or the deck of the soaring infinity pool or restaurant and bar— and drink in the best views of the valley. $350 U.S. While you’re allowed to carry only 1 liter of wine—essentially one bottle—back across the border, more and more Mexican wines are showing up in the United States. You’re not yet likely to find them at your local wine shop, but lucky for us, importers LMA Wines and Truly Fine Wine offer a wide range of Baja wines for direct purchase. Can’t make it to Valle? Here are five bottles to try now. Casa Magoni 2016 Chardonnay/Vermentino (Valle de Guadalupe; $20) Bright and crisp, with a pretty, lingering honeysuckle scent. Paoloni 2013 “Nebbiolo de Guadalupe” (Valle de Guadalupe; $35) Haunting herbal and tobacco aromas; supple and deep. Adobe Guadalupe 2014 “Rafael” (Valle de Guadalupe; $49) Mint and floral scents over briary blackberry flavors; firm tannins. Lomita 2014 “Tinto de la Hacienda” (Valle de Guadalupe; $23) An easy-sipping blend of Cabernet, Merlot, and Shiraz. Monte Xanic 2014 “Gran Ricardo” (Baja California; $60) A serious, earthy, structured Cabernet-based red blend.